So, here is the ad that will be in Cards Magazine in January! I forgot about the due date so I had to design this myself today! I kinda like it! We are suppossed to post new layouts tonight but I am a bit behind on new layouts. I promise to have some up to you by Wednesday! And.. Mark you calendars! There is going to be a SALE at my house Wednesday, November 5-Saturday November 8th! We are going to put all PRODUCT on sale for 30% off (excluding page kits!) I am clearing out stuff so we can grow this little company so come and check us out for gift ideas this Christmas! Also, we are offering Gift Certificates! You can email me at apage4allseasons@comcast.net if you would like one! 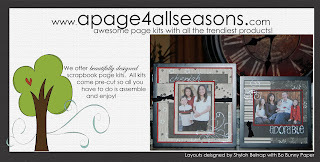 Check out our website http://www.apage4allseasons.com/ to get the newest layouts and please forward our info to your friends and on your blogs! We LOVE you all!